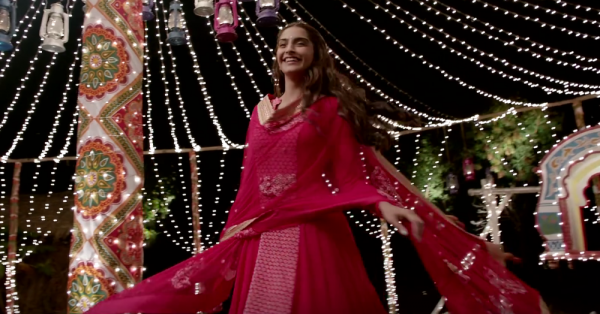 7 Gorgeous Anarkalis For The Newlywed Girl! The first year or the ‘honeymoon period’ is the craziest time for a newlywed! It’s a jam-packed year with dinner invites, family gatherings, festivals and so much more. Honestly, you won’t even get to know how the first year of marriage will pass by. And just so you’re never short of pretty outfits we’ve got you 7 gorgeous anarkalis for the newlywed that’ll have you sorted no matter what the occasion. One colour that instantly lights you up is the good old yellow! 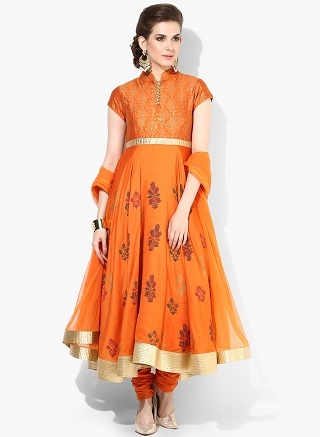 A Surendri by Yogesh Chaudhary creation, it’s a simple anarkali but the bright colour makes it look super festive. We love the clean neckline and the net dupatta with embroidered leaves. Pair it with delicate, long pearl earrings and strappy heels for all those pre-Diwali parties! Price: Rs 13,200. Buy it here. A newlywed’s wardrobe is incomplete without a gorgeous red anarkali. 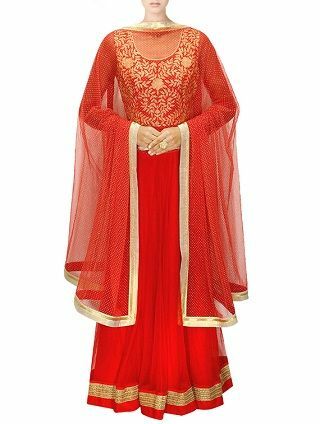 If you're keeping the karva chauth for your husband’s long life, wear this red suit to make your first fast special! Or even for the dinner at your husband’s bua ji’s place! 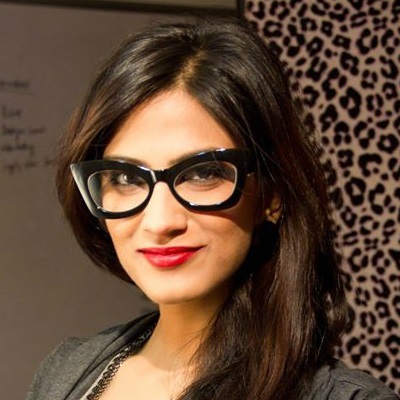 Teamed with chandbaalis and a red lipstick, you’ll look just like a new bride :) Price: Rs 11,200. Buy it here. A heavily sequinned semi-stitched beige anarkali is just what I would’ve loved to wear for my first wedding anniversary. It’s just so elegant and gorgeous to look at. Put on your crystal danglers, swipe on a deep shade of lipstick and make a grand entry as your well wishers gather to congratulate you. Price: Rs 5,199. Buy it here. Ok I’ve already bought one for myself and all the pretty newlyweds should too! 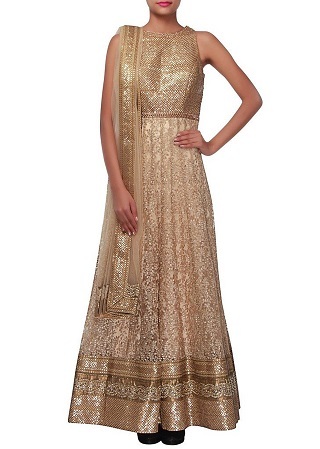 A classy creation by Rohit Bal for Jabong, this one is just perfect to wear for those numerous post-shaadi dinners. We absolutely adore the Chinese collar and the gold waist belt that will flatter your figure beautifully. Kundan earrings and fresh makeup complete the look. Price: Rs 14,999. Buy it here. 5. For the diva in you! Tired of wearing those heavy traditional anarkalis? 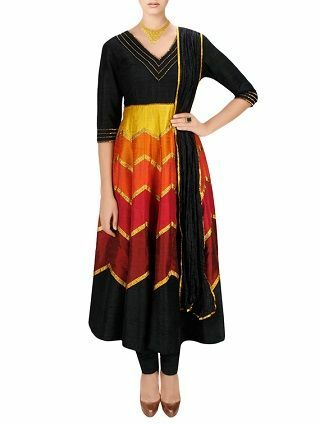 Give your style a twist with this black creation with hues of yellow, red and orange. It’s edgy and modern, and will look great with delicate chunky earrings. Price: Rs 10,800. Buy it here. Nothing looks classier than a well-structured white anarkali suit. On days when you don’t want to wear something too bright, opt for this ‘must have’ white and blue anarkali. For simpler occasions or weekend family meetups pair this with pretty pearl drops. A bright red lipstick goes extremely well with white! Price: Rs. 7,995. Buy it here. 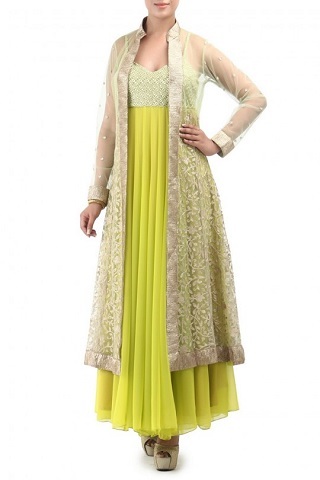 An olive green anarkali with a net jacket is just so unusual! In fact you can wear it two ways! Pair it with one of your existing dupattas minus the jacket for a traditional look or replace the dupatta with the jacket for a modern look. This one your husband is going to love! Price: Rs 11,612. Buy it here.